AP Readiness is free for all LAUSD and Compton USD high schools (excluding LAUSD Independent Charters). You must register online in order to attend. Registration Forms for the 2018-2019 school year. As an AP or AP potential student, you are invited to attend the AP Readiness STEM Program and/or AP Readiness HUMANITIES Program. You are welcome to register for BOTH STEM & HUMANITIES if you choose. These special sessions on specific AP courses will be held on the UCLA campus on Saturdays from 9:00 AM to 1:00 PM once a month from September through April. You can only participate in one AP Readiness STEM subject and/or one AP Readiness HUMANITIES subject. If you are taking multiple AP classes, you must choose one STEM and/or one HUMANITIES to focus on for this program. You are welcome to attend both STEM & HUMANITIES. 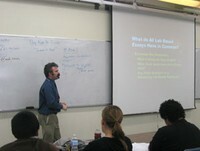 In order to maximize your learning opportunities, we request that your AP instructor attend with you. (You may still attend, however, if your teacher does not). The AP Readiness Program is not designed to take the place of quality Advanced Placement instruction in your school, but to supplement and enhance what is already being taught. The AP Readiness Sessions are held monthly on a Saturday from 9:00 AM to 1 PM (buses provided by AP Readiness depart at 2 PM) at UCLA from September through April. The AP Readiness Program is designed to train teachers in AP instruction while preparing students for AP courses. Observing and networking with master instructors and fellow teachers, educators will build a strong conceptual foundation that will allow them to excel in the instruction of Advanced Placement courses. These special sessions on specific AP courses will be held on the UCLA campus on Saturdays from 9 AM to 2 PM. The AP Readiness Program is not designed to take the place of quality Advanced Placement instruction in your school, but to supplement and enhance what is already being taught. AP Readiness classes will be offered in Math, Science, Computer Science, English, Social Studies & Spanish. 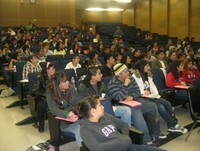 Attend at least four of the Saturday Readiness sessions with their students. Work with the master teacher during the Saturday session. Attend the pre- or post- teachers’ meetings. Must arrange for adult supervision for their students taking the bus. Teachers who complete these requirements will receive a stipend for each session they attend. AP Readiness sessions are scheduled monthly on Saturdays from 9:00 AM to 2:00 PM (classes end at 1 PM, educators are asked to stay until 2 PM for lunch, a reflective meeting & networking opportunities) at UCLA.